I'm using Ubuntu Maverick and Virtual Box 3+. I have Windows 7 Ultimate. The problem is that it doesn't detect USB drives in Windows 7, but USB peripherals (mouse + keybord) are working. I followed these instructions, but I can't find the user group vboxusers. How can I continue? I would also like to upgrade to the latest version without any risk (without losing my virtual hard disk drive). also see: How do I install the VirtualBox version from Oracle to install an Extension Pack? 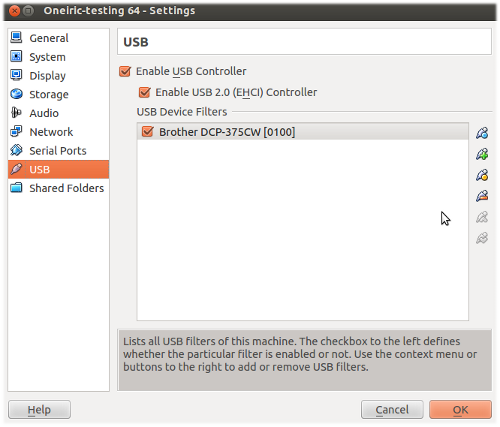 USB 1.0 is supported in the version installed from the Ubuntu repositories (from VirtualBox > 4.x). For USB 2.0 and USB 3.0 we need to install the free (but closed source) VirtualBox Extension Pack (NOT the "platform packages") from the VirtualBox download page. If you had installed VirtualBox from the repositories you have to make sure to choose the extension pack for the right version of VirtualBox. You can see the version of your installed VirtualBox in the help > About VirtualBox menu. For regular updates and bugfixes it is recommended to install the most recent VirtualBox version from the Oracle repository. All virtual machines need to be powered off before installing the extension. Shut down your virtual machine and open USB settings in the VirtualBox Manager. Tick Enable USB Controllerand USB 2.0 (EHCI) Controller or USB 3.0 (xHCI) Controller. If these settings are greyed out, you need to shut down the virtual machine. Tick the device you need in the guest, untick it if you need it in the host. If you can't see your USB device in that list, it means that VirtualBox cannot access your host USB devices. Make sure your user is added to the vboxusers group and that you restarted your host. The selected device will immediately be accessible from the guest. A Windows guest may need additional drivers. Windows 7 needs an additional driver for USB 3.0 support. Windows 10 does not accept an NTFS formatted USB pen drive. By defining USB filters we can define USB devices that will automatically be presented to the guest when booting the guest OS. Click on the green + symbol on the right to add a known device. Note, that some devices may lead to a boot failure of the guest. We can not use these devices for filters. 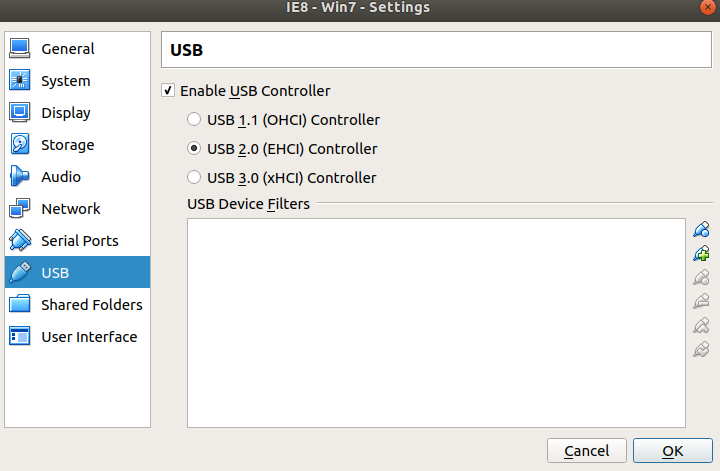 Read more on USB support in the VirtualBox User Manual. Select your username click on Manage Groups and select vboxusers and click add. logout/login to be able to use USB in VirtualBox. The vboxusers will be in the /etc/group file. You edit it with something like nano . Add your user to the vboxusers line, or create one if necessary. As Takkat has pointed out, to get full USB device support, you'll need to install the full version of Virtualbox (not the OSE). I had the same problem. After trying all the other solutions I realised my problem. I had downloaded virtualbox from the Ubuntu Software Center, which didn't have the latest version of virtualbox, so I had accidently downloaded the wrong version of "Oracle VM VirtualBox Extension Pack". open virtualbox, click help, click about, find your virtualbox version number. Goto https://www.virtualbox.org/wiki/Download_Old_Builds_4_3 (replace "4_3" with your version). Download the "Extension Pack" that matches your virtualbox version. Install that, and it might ask you if you would like to downgrade, click yes. Then I could enable USB 2/3 support in the machine settings. What the virtualbox-ext-pack actually does, is download the required files from http://download.virtualbox.org/virtualbox and prompt you to accept the license before installing. If you can list your USB devices being root, but not as a regular user (despite being in the group vboxusers), it may be related to a reached limit of monitored files. You need to increase the maximum number of files your programs are allowed to monitor (inotify). If you have a client that synchronizes your files (dropbox, seafile, etc. ), the limit can be reached and the USB devices cannot be listed. It is reported as a bug issue here. Remember that to paste in the terminal you have to use Ctrl+Shift+V, as opposed to Ctrl+V. You may be asked to enter your password again. Then click on Close and log-out and log-in again. When you start VirtualBox, you should see a whole bunch of new USB devices. If not working, restart your whole host system and try again. Worked fine for me. Watch out: At the first boot of the guest system after installing the guest additions, you will see all usb devices to choose, but it can take up to 10 minutes until the Windows guest activates them after you checked them. Just wait patiently. For me on Kubuntu 16.04 (with virtualbox 5.0.24-dfsg-0ubuntu1.16.04.1 installed via apt) I had used VirtualBox before with USB passthrough working. However, I was no longer part of the virtualbox group (checked with cat /etc/group | grep vboxusers) and so used kdesudo kuser to add myself (can be done with sudo usermod -a -G virtualbox $USER too). I then needed to logout and back in again to use the new group listings and authorise my access. Now when doing VboxManage list usbhost it returns the usb devices instead of just "none"; also in the settings on VirtualBox I can choose connected USB devices to passthrough to the virtual OS. Yay! Not the answer you're looking for? Browse other questions tagged usb virtualbox virtualization usb-drive or ask your own question. How can I have Windows 7 in Virtualbox recognise USB devices? Can't find external CD/DVD in Virtual Box/Windows XP mode? Upgrade gone wrong. wiped existing OS now what? How to run Ubuntu, within Windows, from a USB drive? how to boot USB in virtualbox?